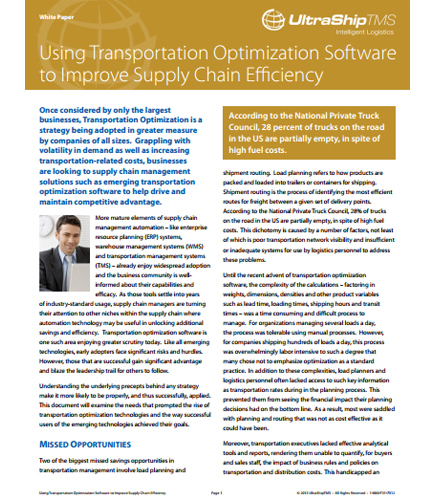 "Using Transportation Software to Improve Supply Chain Efficiency"
Transportation Optimization is a strategy being adopted in greater measure by companies of all sizes. Grappling with volatility in demand as well as increasing transportation-related costs, businesses are looking to supply chain management solutions such as emerging transportation optimization software to help drive and maintain competitive advantage. Do you want to know what are the opportunities you are missing in transportation management? • How marketing executives can be rescued from being handicapped due to lack of effective analytical tools. • It can boost your knowledge regarding in class optimization software which moves towards the integration and configuration process in transportation optimization. • Powerful business planning tools. A complete Vulnerability Management (VM) solution can monitor your environment, enabling you to discover devices running in your network, and determine whether they are vulnerable to attack. The VM solution helps you to find fixes to the underlying problems, and protect yourself while those fixes are being implemented. This whitepaper provides insights on the best practices that will save you time and help you understand what to look for when selecting a VM solution, whether you have a dozen systems or a million. It addresses key questions like: Is the Vulnerability Management a software product or a Cloud service? How does the VM handle multiple locations? What are the top features to look for in VM scanning? Can the VM use authentication for deeper scanning? Can the Vulnerability Management tailor reports to different audiences? Does the VM offer predictive analysis? What information about the underlying cause does the VM provide about each vulnerability?